Okay, I’m not scared of ALL Muppets or puppets. In fact, I would say I’m not scared of MOST Muppets and puppets. Just the ones that look a little off in the eyes, like they might be ready to rip your face off. 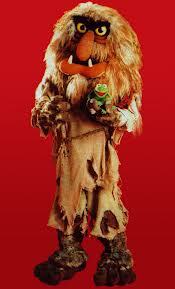 The King of Scary Puppets is, of course, Sweetums. If you read the link above, you’ll kindly note Sweetums was originally a good-guy devouring beast. I discovered Sweetums by listening to The Muppet Frog Prince on my previously-mentioned Dukes of Hazzard record player. A very helpful coworker of mine, who delighted in tormenting me, discovered the film version of The Muppet Frog Prince was available on YouTube. In the privacy of my own home, I decided to face my fears and watch it. Thanks to that viewing, I now remember I was just as scared of the witch with the creepy voice as I was Sweetums. Awesome. Good job, me. Laugh if you like. My wife certainly does. However, remember this. We are all Big People because we were once Little Kids. You were once small, too. And when you were small, some tall thing made you aware of how vulnerable you were to being destroyed by something in the world of the Big People. Under his big, furry mask, Sweetums is my version of the Bad Big Person, reminding me of the defenseless Little Kid inside me. You’ve got your own Big People fears. The question is: Do you know what mask they wear? I love Sweetums. At Disney’s Hollywood Studios, he makes a live-action appearance in the Muppet-Vision 3-D show.